Larne swimmers Conor Ferguson and Danielle Hill set new Irish Junior records on the second day of the Dave McCullagh Memorial meeting in Bangor. 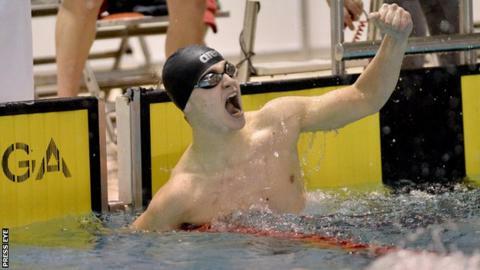 Ferguson, 16, was just 0.3 seconds outside the Olympic 'A' qualifying time in finishing second to Shane Ryan in the 100m backstroke in 54.64 seconds. The time placed Ferguson in the top 15 in the world do far this year. Hill, 17, achieved the European Senior qualifying time in the 100m backstroke, clocking 1:02.98. Hill knocked almost a second off her previous record of 1:03.72 at the Swim Ireland event in County Down. Ferguson took over a second off his Irish Junior record, clocking 55.07 in the heats, before bettering that benchmark in the final. He will have a further chance to secure the Olympic qualifying time at the National Championships at the end of April or the European Championships in London. Both swimmers had set Irish senior 50m backstroke records on the opening day of the meeting on Friday.